(PhysOrg.com) -- A group of French researchers has found that prions are more easily able to jump between species than has been previously thought. In their paper published in Science, they show that prions from other species, implanted in the brains of mice showed up in other organs after a period of time, suggesting that brain autopsies are not sufficient to detect the presence of the disease. British neurology researcher John Collinge has also published a perspective on the topic in the same journal. 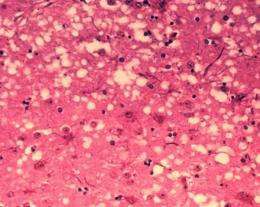 Prions are infectious pathogens that are made up mainly of a form of misfolded PrP proteins. Infections in different species go by different names, the most famous being “mad cow disease” in cows. In humans, it’s called Creutzfeldt-Jakob disease and results in clumps of brain tissue dying resulting in dementia and other symptoms and eventually death. Up until now, it has been thought that there existed a biological barrier that made it difficult for prions to pass from one species of animal to another, but that assumption has been based mainly on brain autopsies. In this new study, the researchers found that when prions from other species (elk, hamsters and cattle) were inserted into the brains of mice that had been genetically altered to express the human or sheep version of PrP, the transfer rate to the brain was very small (just 3 out of 43 cases) as expected. However, when they also autopsied other organs in the mice such as tonsils and especially the spleen they found that the prions had migrated in 26 of 41 cases. They also found that in such cases, the mice didn’t display any symptoms of the disease which leads the authors to conclude that many more animals and humans likely carry the disease than has been thought. The concern is that human carriers could be inadvertently infecting others through blood transfusions, organ donation or even via surgical instruments since prions have been found to be resistant to normal antibacterial processes. And if that is the case, it appears likely that at least some of those infected would eventually find themselves falling prey to Creutzfeldt-Jakob disease. These new findings come on the heels of recent news that Britain’s NHS National Prion Clinic has sent out messages to neurologists across the country indicating that a new blood test has become available, which has come none too soon as a recent survey of tissue samples taken from removed appendixes showed that as many as 1 in 4,000 people in the UK could be carriers. This is scarey news and should cause a spin off of many research projects to start up. We can plot a graph that will show for example how many people have had dentistry and or any form of operation. What about eating at a restaurant? Then repeat this over a number of generations. After not too many generations we will have a very high infection rate. how long before we get close to 100% infection.